This is my mat cutting and shipping area. First the paintings are weighed down over night and made totally flat, then the mats are cut, then they are backed and placed in a plastic envelopes. Next they are sandwiched between two pieces of cardboard and finally into the mail envelope. It a long process and is part of being an Artist. I wish I could turn this over to someone else, but there isn’t enought profit to hire this work out. It takes so long for me to get this done, sometimes I have to spend two days a week getting all the paintings ready to go. 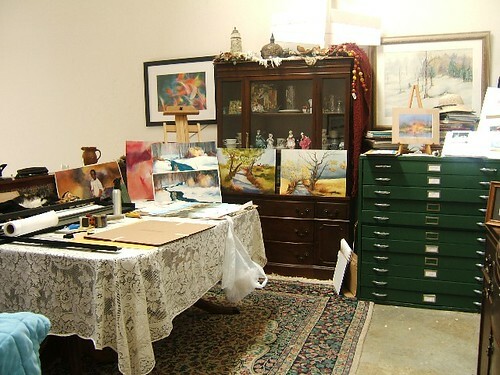 Some go to The Art league where I have an area to hang work and to show a series of paintings. Others are stored for possible sale on E bay Usually in the flat file. Then there are the few that are framed. These are special and they go into shows or into a gallery. You can see in the photo above, that I work in a series when painting the larger works. Usually two or three paintings from each idea becomes a series, but some ideas like the koi series may never end. I find them to be fasinating subjects and constantly evolving. Tomorrow, I have to rush back from Reliegh NC ( about 3 hours away)to get my daily painting in before the deadline. I’ll paint it tonight. I’m very excited. I’m going to see the Monet’s. 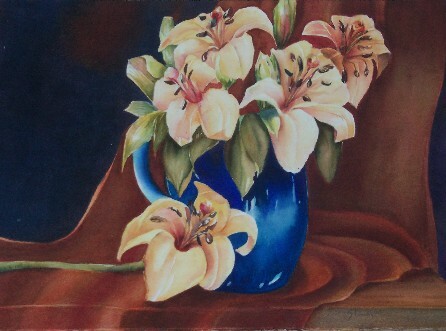 This wonderful little painting measures 8 inches by 10 inches. Its actually a little bigger than most daily painting but I painted it to be a companion piece for Cornfowers which is the same size. 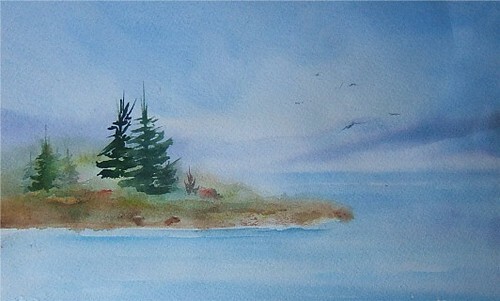 If you would like to bid on this painting, it will go on eBay at 2:00pm eastern time. Check my ebay store. 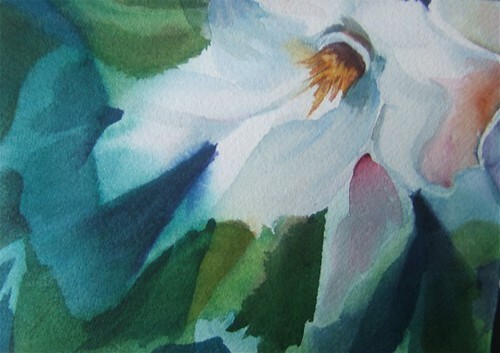 This vibrant white flower nestled in the greenery was painted a little abstractly, yet gives the feel of a real flower. For some reason it reminds me of a star. 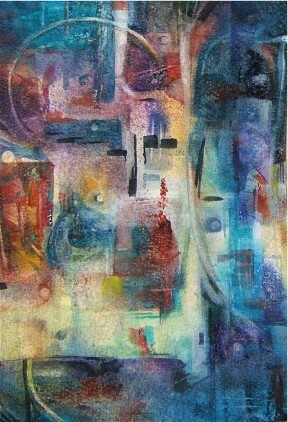 It is painted on 300 lb paper and this gives it a rich solid feel. 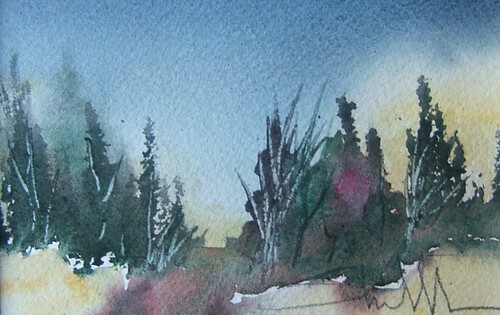 This small post card size (3.5 by 5.5) painting is an impressionistic painting of trees and sky. It is matted and fits into an 8 by 10 frame. It will be placed on eBay tonight with an opening bid of only $6.50. I painted this painting quickly and without thought or a drawing. It isn’t too complicated, but I find it has a relaxing feel. 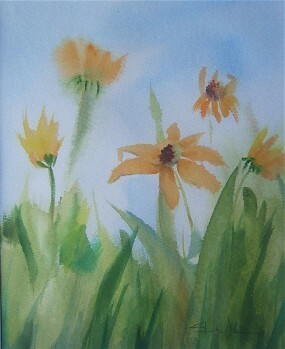 This is a quarter sheet size watercolor which is 11 by 15 inches. 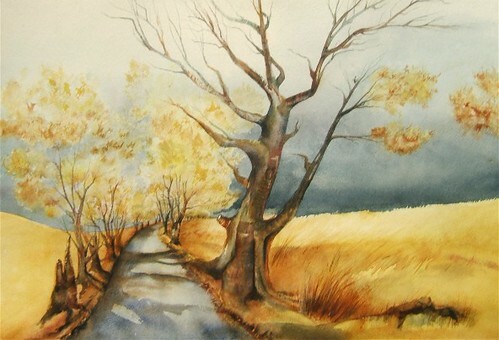 Some would say it looks more like an oil painting than a watercolor. That’s because sometimes I paint my watercolors in a soft wet natural watercolor style and other times I paint dry with multiple glazes. This was painted in glazes. The Glazing method is simple and not difficult to learn but it takes a lot of patience. You must wait for every layer to dry before you put on the next layer. You usually have an under painting which is not always obvious at the end but its like oils, it will radiate thru the painting. Sometimes it is allowed to show. It tends to harmonized the piece. So many landscapes this week, to break things up a bit, I decided to do a landscape in another style. rather than impressionistic I decided to do an abstract. We had a good Thanksgiving, drank a little wine, ate some turkey, drank some more wine, had some pie. you get the idea, Oh boy, I’m full. Its almost 9 pm and everyones gone home. The dishes are done and I think I’ll draw. I stopped by the video store today, and picked up the Davinci Code so maybe I’ll draw while I watch it. I hear its rather slow. Hope your day went well and if your thinking of shoppping tomorrow your a braver soul than I.